Recently my personal research took me to the October 24, 1968 edition of the St. Louis Post-Dispatch. On page 57, was an article about supporters of the then presidential candidate of Alabama Governor George Wallace. Wallace was in a three-way race with Richard Nixon and Hubert Humphrey. Wallace was a poor third place against Nixon and Humphrey; however, he did manage to keep Nixon and Humphrey in a statistical tie with each failing to receive more than fifty percent of the vote. Ideologically, there is no difference between the 1968 George Wallace supporter, and the 2017 Trump supporter. Both act on emotion and opinion with few facts to support their position. They are unified in the opinion that non-whites are, at least in part, the cause of their problems. They are also completely deaf to any idea or fact that doesn’t support their position, and ignorant of how corporations and the wealthy have manipulated them into making decisions that go against their own interests. Our country’s problems aren’t caused by bad politicians. They are caused by uneducated and unintelligent voters who don’t have the ability to understand what they are doing…and never will. October 1968. Richard Nixon, Hubert Humphrey, and George Wallace, and were desperately trying to win the Presidential election. Former Vice President Nixon had moderate conservatives and war-hawks backing him. Vice President Humphrey had Democratic core voters and intelligent liberals backing him, and Alabama Governor George Wallace was the darling of racists and right wing extremists. In 1967, most had assumed President Lyndon Johnson would run, and likely win reelection. Those in his administration’s military leadership offered an optimistic view of the Vietnam War, with one of his recent close advisors publicly saying that the enemy was losing their will to fight. Despite the rosy picture, over 70,000 U.S. soldiers had been killed or wounded during the war, and 1,000 more were being killed each month. Opposition to the war was tearing the Democratic party apart, and it overshadowed almost all other political issues. In late January 1968, North Vietnam launched the Tet Offensive. Ultimately, the invading armies were beaten back, but the offensive shocked the United States. Those confident of Johnson’s ability to bring a successful end to the war waned in their support, and in March, the New Hampshire primary gave Johnson an uncomfortably narrow win over Eugene McCarthy, who was considered a relatively minor candidate that focused on an anti-war campaign. Soon after the primary, Robert Kennedy entered the race, and Johnson ended his campaign. (Although Johnson probably dropped out because he doubted he could beat Kennedy, it is noteworthy that President Johnson’s decision to drop out was heavily influenced by his health concerns. Specifically, that he would likely not live through another term.) Without Johnson in the race, there was no single, obvious choice for President. The year became more chaotic after Johnson dropped out. Martin Luther King, Jr. was assassinated on April 4. Robert Kennedy was assassinated on June 6. Anti-war and civil rights protests and riots, along with mounting U.S. casualties in Vietnam dominated the news everyday. By October, voters were reacting to the the presidential election as the prescription moment in the United States. The next President would either cure or kill our country, depending on the point of view. People who sought a calm return to normalcy were split between Nixon and Humphrey. However, there were people who sought a disruptive choice for President, in the hopes that he would revive the Confederacy’s goal of remaking the United States into a white dominated government that would undo decades of work to create equal rights for all citizens. Their choice was George Wallace. While many may believe that Wallace was a bigger threat to Nixon’s campaign, the reality was that the Governor from Alabama was luring as much as half of the support of the unions that normally support the Democratic ticket. Uneducated, Caucasian, blue-collar workers were taken in by Wallace’s hardline racist positions. The civil rights riots generated fear among white voters, many of whom, felt they were not racist, but were of the opinion that life for the African-American would be fine if they would just settle down and accept their lot in life. In the end, Nixon won with less than half the vote, and was in a statistical tie with Humphrey, but he had a significant electoral college margin. Wallace won over almost ten million voters, and certainly had an impact on the outcome. Both Nixon and President Johnson used last-minute tactics to sway voters in the final weeks. President Johnson publicly suggested that a Vietnam peace deal was imminent, and Nixon’s campaign used back channels to interfere with those peace efforts, coupled with a spy in the White House that kept the Nixon campaign informed of Johnson’s diplomatic efforts. Mitt Romney had over two weeks before he had to reveal his choice for Vice President and it would have been advantageous for him to wait. Keeping the Vice President choice a secret would have built up anticipation and the pundits would not have been able to resist continued speculation on the selection. All this would have climaxed with the announcement of the choice on August 29, in prime time on center stage of the Republican National Convention. Instead the announcement was handled with all the grace of an engagement announcement of a pregnant daughter. The news leaked on a Friday night during the final week of the Olympics and announced before most of the country was awake on Saturday morning. A Vice President choice should reflect the wisdom of the campaign, so why was this one handled as badly or worse than the McCain/Palin fiasco? In 2008, John McCain was desperate to shake up the campaign and re-energize it. Unfortunately, Romney has the same type of desperation, but for different reasons. Romney certainly needs to re-energize his campaign, but what is more critical is the need to shift the focus off the charges that he hasn’t paid taxes for ten years. Romney has his back up against the wall on this issue. If it turns out to be true his campaign is over. Romney selected Paul Ryan, who seeks to control, not serve Americans, and is a no-compromise, anti-government, right-wing extremist similar to McCain’s Palin choice. Ryan will deliver the voters who are sworn to hate Obama and liberals under the idea that the ticket can be elected by 25% of voters. It didn’t work for McCain in 2008, and it will not work in 2012. It is not a smart choice, but at this point Romney needed something, anything to change the subject of the campaign. 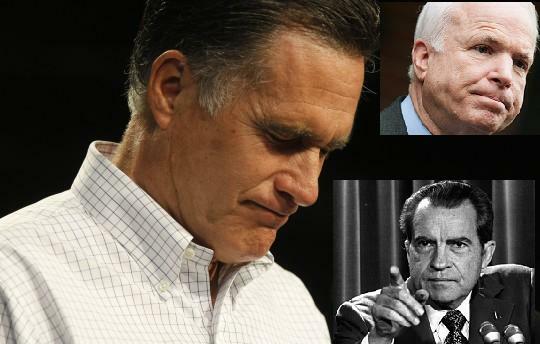 Romney is operating like Richard Nixon in the belief that he can keep his worst secrets hidden through denial, lying, and non-cooperation. Instead he’s put a spotlight on the issue. His tactic of challenging people to ‘prove’ he didn’t pay taxes when he holds all the proof only makes him to looking guilty. It’s obvious he is hiding something in his financial past and if it is not about paying any taxes for ten years, then it must be something as damning. Romney’s campaign is within hours, days, or weeks of imploding. If he fails to make his tax returns public then it will dominate the conversation about whether he is fit to be President. If he releases them then the truth must be bad enough to destroy his campaign. The only question is how Romney’s right-wing shift followed by complete collapse will carry over to other politicians who have embraced the extreme right.